Effectively manage your hotel or guesthouse. 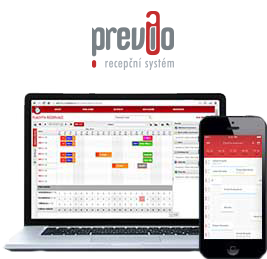 When using Previo PRO you will have direct control over all your reservations with a clear reservation overview, easy account management, document distribution, and payment allocation. And yes - we also provide all the important administrative and governmental reports needed to run your business smoothly. Previo is a cloud application - with internet access you can log in anytime, anywhere. We also provide you with a mobile application for times when you do not have access to a computer. Be in control of your reservations. You can easily find the reservation you're looking for using full-text search in the reservation calendar, which you arrange. The calendar is interactive, so you can move, extend, or shorten reservations with a simple drag and drop method. Under the right mouse button you will find the most commonly used operations. Cancellation of reservations and fast check-ins have never been easier. 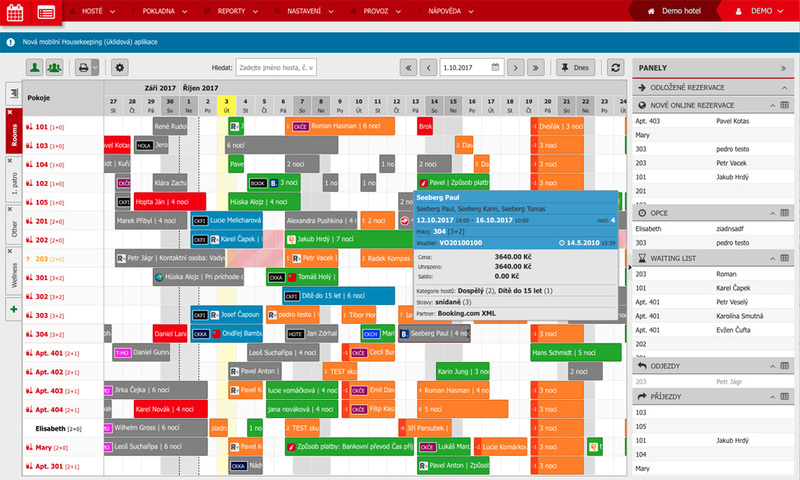 You can also manage your health facilities, sports fields, and restaurant using minute reservations. Do you know your RevPar, occupancy rates, or the total revenue for your hotel? We Do! Our manager reports contain all the information you need to effectively run your hotel or guesthouse. Save time with automatically generated reports for government authorities. You can of course adjust reports according to your needs. Improve marketing using your guest database. You can find reservations using full-text search and send newsletters to specific groups of guests. The database gives you access to the reservation history of your guests and guest companies. You can set automatic discounts for certain companies or add labels to make special groups. Your guests will also appreciate a birthday greeting which is sent automatically by Previo. Room accounts will provide you with a detailed overview of services rendered for each reservation (meals, accommodation, taxes, retail sales, discounts). 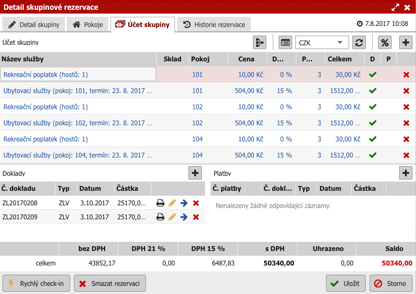 Items will be automatically loaded to the room account according to your pricelist. You can then easily print invoices for each room and also add payments to balance the account. Group reservation will give you the option of using room accounts or group accounts for the entire reservation. Keep track of inventory and all retail sales including sales made through room accounts - access the information from reception. We saved the best for last. Our Front-Desk system connects to other systems you use to manage your hotel. You can easily transfer restaurant or phone bills to a guest account. Export invoices to your accounting software or connect a heating system. 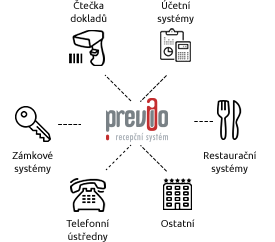 You can even add guest accommodation cards with ID scanners - these are the possibilities of Previo PRO. Take a look at the full list of partners. We have two versions of the reception system - LITE for smaller, low-cost devices and a PRO version with comprehensive functionality for hotel professionals. 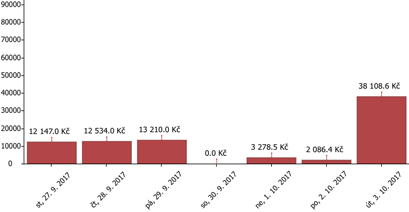 Both versions can be connected to Czech and global reservation portals and also to the booking engine on your website.